The story of Irene and Rene was featured in the 2005 documentary, Rene and I. 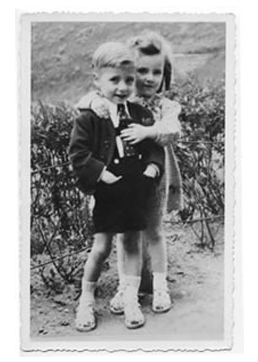 The film, directed by Gina M. Angelone, is told from Irene's point of view and details her life during and since her time as a Mengele Twin at Auschwitz. Irene's strength in overcoming multiple tragedies in her life is highlighted in the documentary and her story is about so much more than just being a "war orphan" as in the 1947 Life Magazine story. Her resilience and positivity shine in the film as she becomes an exceptional student, dedicated mother, and artistic calligrapher. In the last decade, Irene has had to confront Multiple Sclerosis and the film reveals her strength and positivity even as she struggles physically. The film was reviewed widely and has become a source for Holocaust education. Discussion of "Irene Guttman: Rene and I"
Version 8 id 27951 of this page, updated 22 November 2014 by Rachel Deblinger. Created by Rachel Deblinger.